Hello and Welcome to the first day of previews for the Sparkle Creations Rubber Stamps May release! Sparkle is releasing 2 new images at midnight EST this Saturday, May 14 .. Today we are previewing Shopping Emily (and a new sentiment, "with the right accessories, you can do anything")! My DD, Sabrina, is REALLY into High School Musical 1, 2 and 3.. especially 2. Thus, I have also seen it a few times.. I'm pretty sure I was channeling Sharpay when I sat down to make this card.. lol! 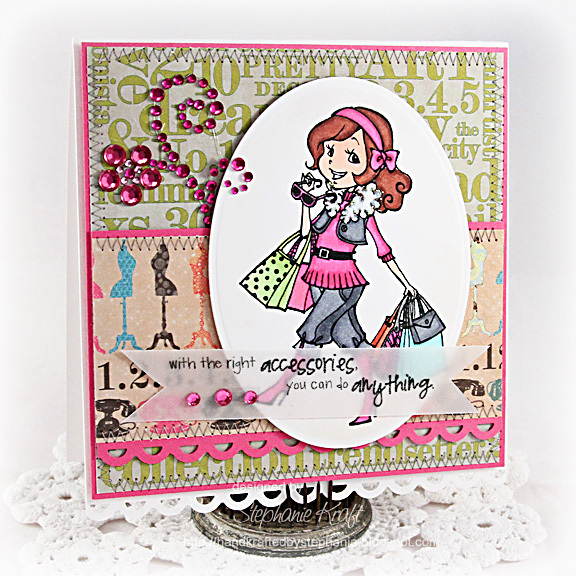 I paired Shopping Emily with some Webster's Pages Trendsetter paper and of course, pink bling! Be sure to visit the rest of the SCRS designers for more peeks of Shopping Emily. Sparkle will be giving away a Shopping Emily to one lucky person! For a chance to win, you need to comment on all of the designer's blogs (list below). Then head on over to the SCRS blog and comment on the Emily post. You have until midnight EST each day to comment. The lucky winner will be announced the following day! ETA: Due to Blogger being down, you have through the weekend for a chance to win Emily. 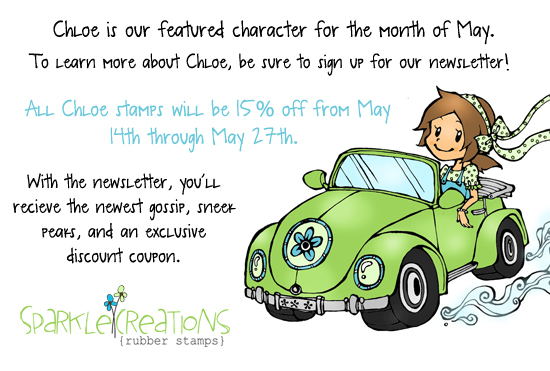 Sparkle Creations Rubber Stamps Blog and sign up on the sidebar. Accessories: Petite Oval Nestabilities (Spellbinders), Apron Lace border punch (Fiskars), Markers (Copic), Bling (Prima), Foam tape, Thread, Sewing machine. So cute. Love all the pink! So darling! Had to laugh at the HSM comment. I love the pink bling! What a fun, colorful, stylish card!!! Wow, these papers are perfect for this image. Great card. I love the bling on this card. Very Cute! Love this! The papers are fabulous and the image super cute! I like how you incorporated the vellum strip with the sentiment and the extra bling! Great card! Love the use of vellum! Awesome card! Just brilliant, Steph!! I love how you did the sentiment! Very pretty and love the bling! Very pretty! Love the sentiment on the vellum..awesome! love the sentiment on vellum. beautiful card, Stephanie! Love the "fashion" paper you have used, and the swirly bling!! Sparkly and GORGEOUS!! What a totally fun card!